There is no doubt that an iPhone 6 or 5S will arrive in a couple of months time and the phone will be followed up with a new iPad mini 2 and iPad 5 shortly after. This is how it happened last year, and we see no reason to doubt the same pattern this year even if some blogs dance around with conflicting release date rumor. While we are almost certain a new phone will launch this year, its name is another matter and leaks hinting at two models might change the way Apple decide to name the handsets this year, Personally, we would like to see no confusion in 2013 with the name process and love the idea of a higher spec iPhone 6 in metal and a cheaper iPhone 5S in plastic that has been hinted in leaked photos. If Apple launch an iPhone 6 will a little innovation and higher specs, then this delivers a clear understanding of the better handset. The leaks suggesting a plastic iPhone 5 would only confuse matters in our opinion, especially considering we have an iPhone 5 in metal currently, so if Apple do launch two models with different price points then new names would be much better and serve a purpose for the iPhone 5S name. iPhone 6 and iPad mini 2 with exclusive iOS 7 features — some of our readers are betting that some new features will not arrive in iOS 7 beta 4, but rather later on with iOS 7 Gold Master or even with the iPhone 6 or 5S launch. There have been plenty of suggestions for new features in iOS 7, although one of the most interesting was adding quick reply to messaging and also the ability to add photos to the “contacts list view, conversation view and messaging list”. Another one of our readers made an interesting point by stating, “they did this with Macs, but we will most likely see this as an exclusive feature on iPhone 6, 5S or even later in iOS 8”. While we don’t necessarily agree with these comments, it is true that Apple likes to sell a new phone with some exclusive features when possible. We saw this with Siri, and we will see it again with other new features that would be possible on other devices but are saved as a selling tactic for new hardware. The current iOS 7 beta versions have revealed that iPhone 4S lacks Airdrop as seen with iPhone 5 and iOS 7. This might not change in the coming betas, also we have seen some features left out of the new iPad mini software and we cannot be sure if this will change by public release. This includes certain camera filters and Panorama, but the iPad mini 2 might include these iOS 7 features and more once it’s released around September. You can expect the iPad 5, iPad mini 2 and iPhone 6 to include higher specs and camera upgrades, so we’d expect all the iOS 7 features on these devices but there’s a good chance of some exclusive features as well. 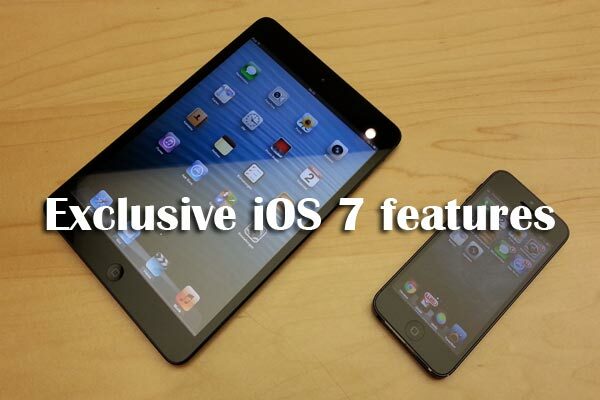 What unique iOS 7 features and abilities would you like to see on iPad mini 2, or iPhone 6 and 5S? Would you also like to see clear name differences between a plastic and metal iPhone? If we do see a fingerprint reader then this will certainly come with some built-in features with iOS 7, so an iPad mini 2 and iPhone 6 with this technology could bring about a few extras. I agree with Bob. Having my phone showing the callers picture on incoming calls was a feature I had 6 years ago in non apple phones. I think Apple better start focusing on leading the pack in new technology than following it. The current marketing plan has been to sell the same technology over and over again with just a little window dressing. This is being done in the attempt to get the public to buy the same basic product every year, when it should be good for 3 to 4 years. From the people I talk to, their attitude is that they are getting angry at Apple for treating them like morons. Apple needs to realize that if they expect stay in business long term they need to get back to their roots in product and software design quality and creating value per dollar compared to their competition. Lets face it, they are building their products with labor who gets paid $2.00 per day when they charge the highest prices in the industry. Really Apple? I miss the old Apple who’s focus was to make me, the customer, happy. I miss the old Apple who believed in America. I think you misunderstood his comment. He is talking about the contacts list having pictures. The very first iphone had pictures for incoming calls as long as you had a picture for the contact. Apple pays some of the best wages in the industry. Also, iPhones are priced nearly the same as their Android counter parts.